Where do I use my Sage voucher code? Sage provide the ultimate business solutions with their Cloud package. With the business cloud, you can expect accounting, payroll, finance, enterprise management, people and payment solutions that are fast, flexible and better than ever before. Sage also offers the Sage 50 HR, the Sage 50 P11D, software for Macs and a handy accounting app. Shop for your solution by industry or business size and find manufacturing, discrete manufacturing, process manufacturing, wholesale distribution, professional service, education and non-profit solutions for startup, small, medium and growing businesses, as well as multi-sized enterprises. Sage also provides an accountants section on their website that’s dedicated to the solutions of accountants and accounting queries. They also have a partner programme that allows users the opportunity to sell, develop, service and integrate within their business. You can discover all the information and benefits of this programme in the partner's section on the website. And, as well as all this, Sage also boast an online shop section. Here you can find all sorts of useful products including software, stationery, add-ons and training products. As well as providing a vast array of products and solutions for business, Sage also take part in a lot of philanthropy work with the aim to offer day to day solutions for the less fortunate too. Last year, Sage and its employees supported a number of organisations, giving away 3,480 items in in-kind donations of food and toys to help local charities. Sage employees are also given five paid days per year to help a charity of their choosing. And, as well as this, Sage also provide complimentarily and discounted software to high schools, universities, and colleges - giving away £1,000,000 in software since 2008. Sage provide a ‘Sage Advice’ blog section on their website that aims to offer wisdom for smarter businesses. In this section, you can find detailed answers to common questions like ‘What does making tax digital mean for businesses?’, ‘What do the Brexit technical notices mean for small businesses?’ and ‘What do HMRC's updates mean for me?’ Sage also provide advice that’s specific to your business in the form of articles and videos. These posts are updated regularly to keep up with the ever-changing economy and business world, allowing employers and entrepreneurs to discover new beneficial information every day. In the blog you can also check out an editor's selection, a featured authors section and trending posts for the latest and most pressing advice on all things accounting, administration and strategies. Sage has a section on their website dedicated the helping accountants and business accounts. In it, you can find solutions for accountants and bookkeepers- ready for making tax digital- solutions for your practice, that can save time and serve your clients better, and solutions for managing payroll, that’s perfect for your bureau and clients. In this section you can also find expert advice, support and education as well as information on booking for your clients, investing in your future and Sage’s current developments and plans for the future of accounting. 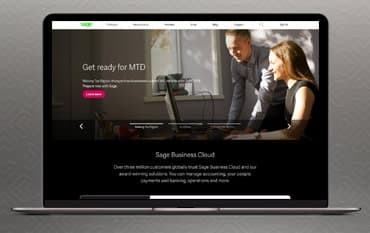 Shop by product in the accountant's category and discover the Sage Accountant Cloud, Cloud Accounting Solutions, Cloud Compliance Solutions, Payroll Bureau Solutions, Desktop Practice Solutions, a Sage Accountants Network and solutions for Accounting Partners. Sage also hold many informative events for all their business solutions including accounting, to find out more simply head to their website and click on’ Join us at an event near you’ for details. Sage is the market leader for integrated accounting, payroll, and payment systems, supporting the ambition of millions of entrepreneurs, across 23 countries around the world. Sage help drive today’s business builders with a new generation of solutions that will help manage everything from money to people. Whether you’re a small business, a long established business looking to update your systems, or a growing business with Sage you can take care of your accounting, finances, enterprise management, payroll and banking for an affordable price. And if you buy online with a discount code from us, you can enjoy great savings on your new business solutions too.